Above: Northern Marsh-orchid photographed in Newborough Warren National Nature Reserve in Angelsey, Wales, during late spring. Very few cameras can do justice to the intense dark purple colour of the Northern Marsh-orchid. The Northern Marsh-orchid grows to between 15 to 30cm, and its short and somewhat stumpy appearance is one of its main distinguishing features, particularly in the sites where it occurs with Southern Marsh-orchid Dactylorhiza praetermissa which is taller - typically around 50cm. The leaves of Dactylorhiza purpurella are usually unmarked or sometimes faintly marked. 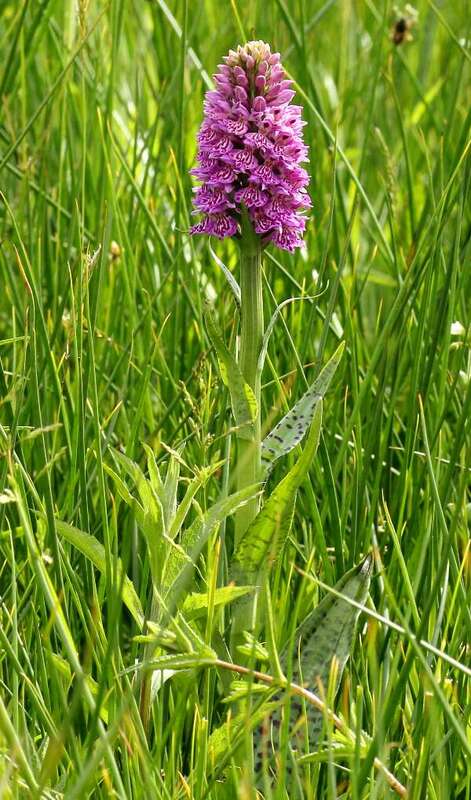 The exception to this is Dactylorhiza purpurella var. cambrensis, which has darkly spotted leaves and bracts and which occurs on the coast of Wales from Cardigan Bay up to and including Anglesey in North Wales - see below. The inflorescence of the Northern Marsh-orchid often has a flattened top and is smaller and with larger and fewer flowers than the Southern Marsh-orchid. The lips of the flowers of the Northern Marsh-orchid are distinctly angular (almost diamond-shaped) and barely lobed whereas those of the Southern Marsh-orchid are rounded, slightly folded back and with a pronounced central lobe. 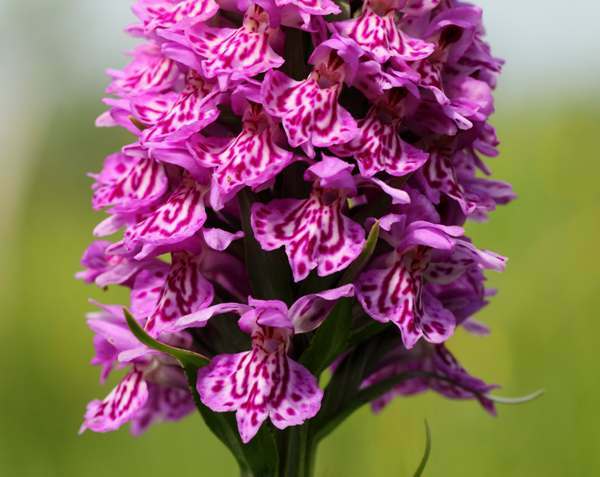 The range of this orchid is predominantly in the northern part of the UK extending from the West Wales coast and up into Scotland and the Western Isles. It is also found in Northern Ireland, but is rare and very localised in Southern Ireland. On mainland Europe this orchid is known to occur in Sweden, Denmark and Norway. 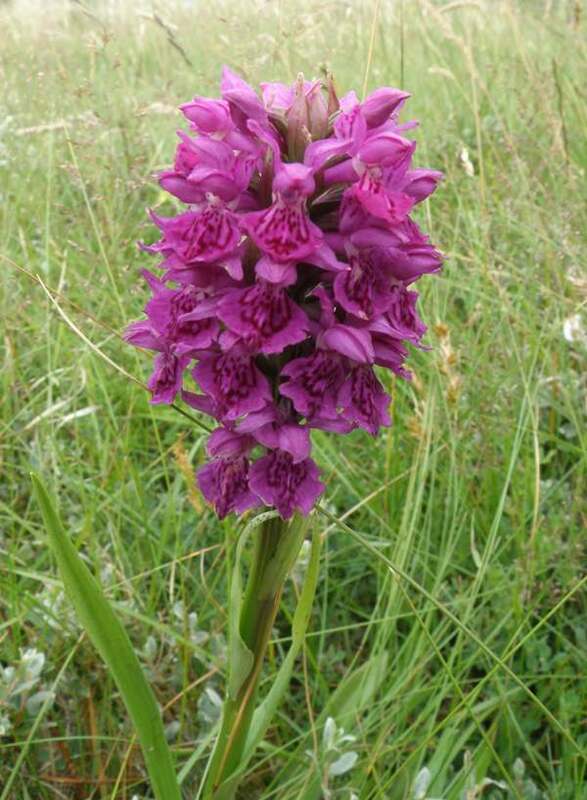 Northern Marsh-orchids are found in damp coastal dune slacks in Wales and Scotland. In the Outer Hebrides they grow in large colonies in the machair (sea meadows). In Norway and Sweden this orchid also occurs on the western coasts in dune slacks and is given the name Strandnycklar - 'strand' being the Swedish word for beach. Dactylorhiza purpurella flowers from late May into July. Dactylorhiza purpurella var. cambrensis growing in a dune slack in Anglesey, North Wales. The leaves and bracts of the plant are marked with dull purple spots. 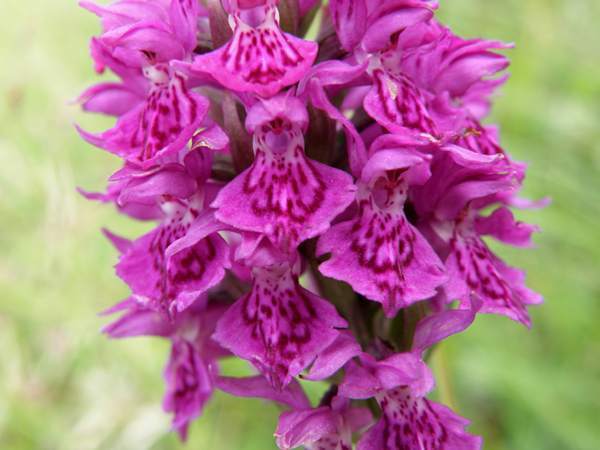 This variety of the Northern Marsh-orchid, sometimes referred to as the Western Marsh-orchid, occurs on the coast of Wales from Cardigan northwards, and is mainly differentiated by the dark purple marks on the lips and the bracts of the plant, which vary greatly in intensity. The flowers are paler in colour and their lips have a distinct lobe not present in the Northern Marsh-orchid. This subspecies is also recorded from western Scotland. 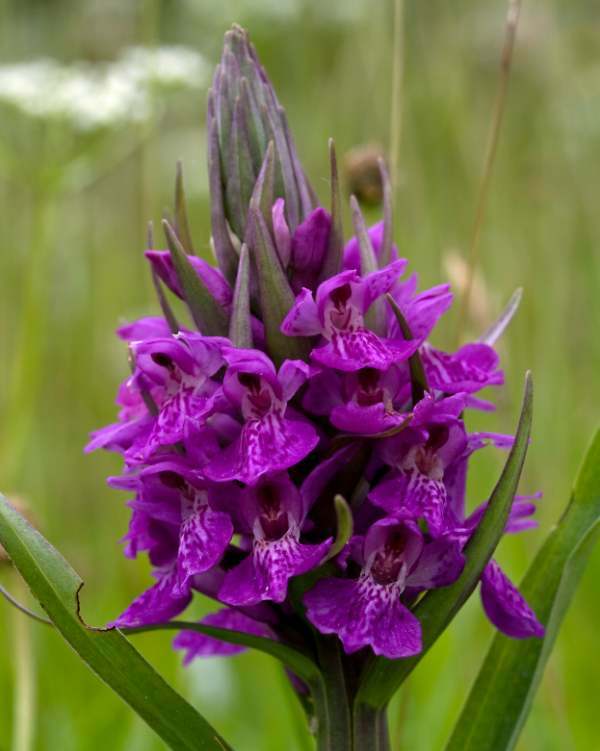 Newborough Warren National Nature Reserve in Anglesey is one of the places where this Northern Marsh-orchid variety is regularly recorded, and it is also found in the dune slacks around Aberffraw which is slightly further around the Anglesey coast towards Treaddur Bay. Plants are also known to occur in meadows near to the coast of Cardigan Bay. A close-up picture of the inflorescence of Dactylorhiza purpurella var. cambrensis reveals the heavily marked flowers with distinct central lobse on their lips.